All the planning and preparation lead up to one single day, and for most, the whirlwind of your wedding will pass in the blink of an eye. Snapshots from the day turn into keepsakes for a lifetime—which is why choosing the right locations can be so important. From iconic settings and popular spots to hidden gems, local wedding photographers share their favorite backdrops for capturing the moment on your big day. The Queen City’s beauty shines through during all four seasons, but we Buffalonians know that on any given day, Mother Nature may very well be a force to contend with. During the warmer months, it’s all about finding interesting ways to utilize the backdrops you have at your disposal. The colder months can present more of a challenge, but photographers always have trade secrets that can help combat any sort of weather. 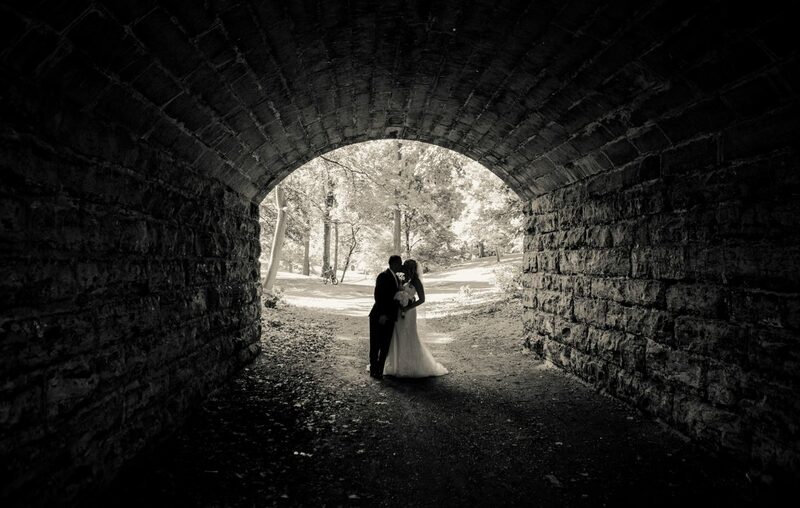 The most iconic settings for engagement and wedding photos are popular for a reason: These natural and architectural landscapes are instantly recognizable and provide beautiful, clearly Buffalo backdrops for local couples. Well-known Buffalo landmarks will always make for memorable photos, but there are also many beautiful spots in the city that couples wouldn’t automatically think of. Despite trying every trick in the book, sometimes the weather just doesn’t want to cooperate. But there are many beautiful indoor locations in and around Buffalo that can provide the perfect setting. The Ellicott Square Building, Statler City and Shea’s Performing Arts Center are all favorites of Wozniak’s. “All three places have incredible architecture to work with,” he said. At the end of the day, all any couple wants is a wedding album filled with beautiful memories—but creating that vision involves a little bit of research, some planning and a lot of trust. There are many places that couples can’t just show up to, so it is important to “make arrangements in advance,” said Wozniak. “Some also charge for use,” he added, which is why couples need to set a budget and to keep an open mind when choosing locations.